As the Patriots prepare for yet another Super Bowl, those training for Boston should head Bill Belichick’s chant from last year’s parade. While you shouldn’t run everyday, No Sunday’s Off should be in your head. Follow your routine, train every Sunday with a quality long run, and build the endurance, mental toughness, and confidence running hills by running the same routes Clarence DeMar and Bill Rodgers did while preparing for Boston. 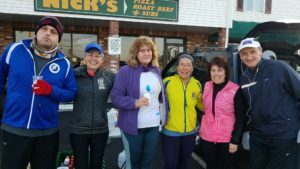 Last week over 50 runners, maybe 60, joined in on the Sunday Long Run. 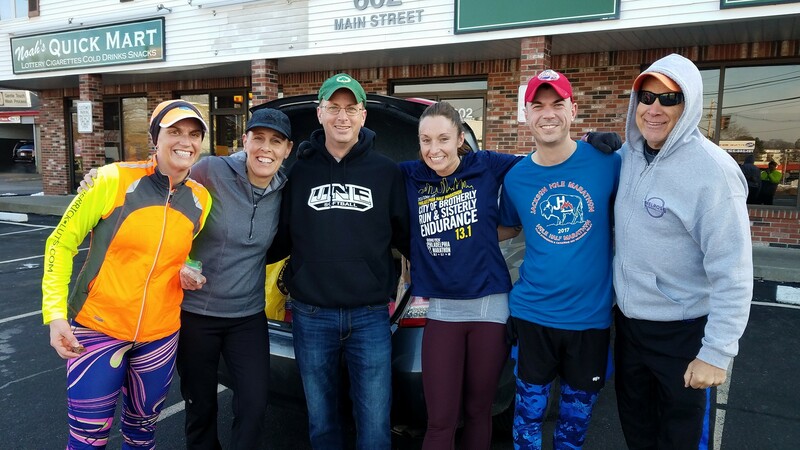 The weather was nice, the route was flat, and a recovery run got you ready for this week’s 14.6 mile run for the Marathon trainers and 7.1 for the Half Marathon trainers. 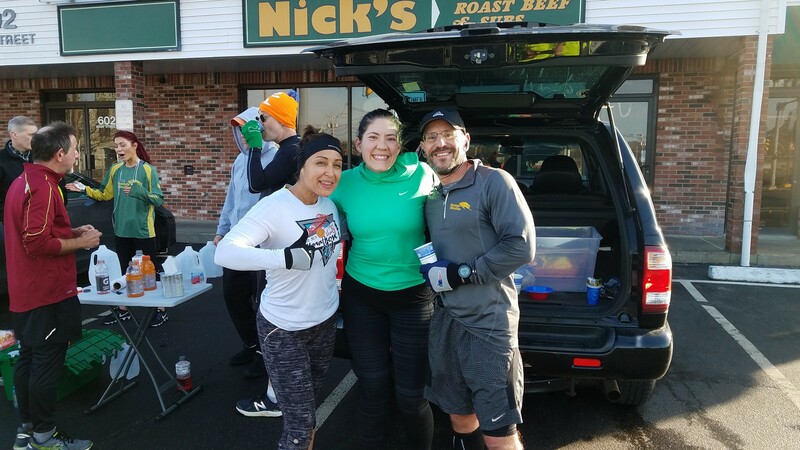 The water stop at Nick’s Pizza was full of smiling runners enjoying a strong long run. This Week we’ll be running the Melrose Law Enforcement Half Marathon Course. This hilly race, held in the late 1990s was the predecessor to Boston’s Run to Remember. 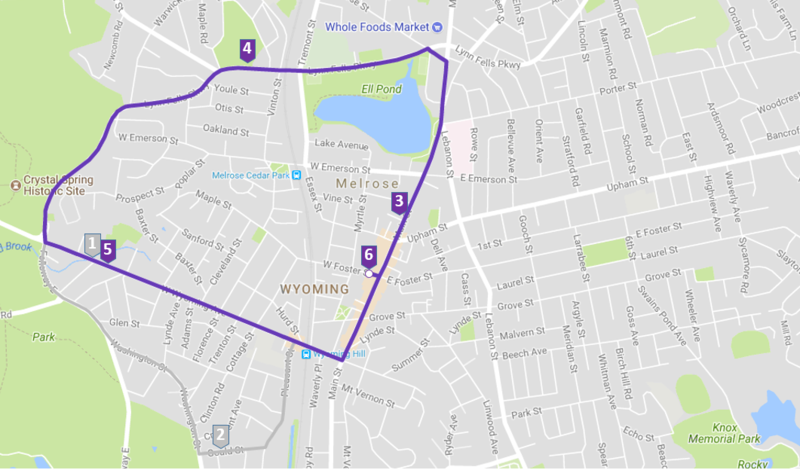 The route starts out up Main Street, past Ell Pond, to a left on Melrose Street followed by a quick left on the LynnFells Parkway. After passing Melrose High School the short route runners will continue along the LynnFells to Grimsby’s for a short water stop. 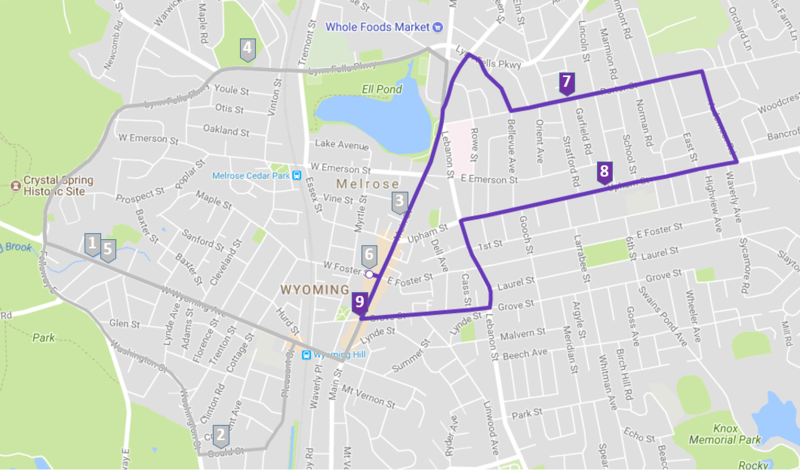 Longer route runners will loop Ell Pond with a left at the traffic lights onto Tremont Street, and lefts on Lake, Emerson, Main, Melrose, and then LynnFells to pass Melrose High School again. On this pass you’ll continue on the LynnFells for a water stop at Grimsby’s. After the Grimsby’s water stop both marathon and half trainers will continue straight as you cross on to the Fellsway East. Run through the hills to the traffic circle where you’ll turn right onto Highland Ave. Run along Highland until you get to the water stop on the left side of the road. 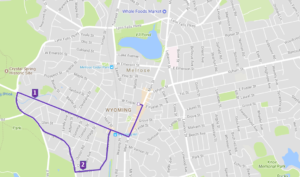 After this stop the runners going long will turn left on Elm Street to loop Spot Pond while the shorter route runners will continue straight onto Woodland Road and turn right on Pond Street to head back down past Grimsby’s onto West Wyoming. At the set of traffic lights at West Wyoming and Main, turn left and head back to Brueggers. Long runners follow Elm to the end where they turn right. We did this loop a few weeks ago so you should be familiar with it as you go under I-93, over I-93, and over to the Straw Point parking lot at Spot Pond. A small water stop there will help you continue onto Pond Street, past the Stone Zoo and onto Woodland Ave. Pass Flynn Rink and back to Highland Ave where the water stop will be waiting for you. After this stop, turn left onto East Border Road and at the lights turn left back onto the Fellsway East. Run the the hills and pass Grimsby’s onto the LynnFells Parkway. Head past Melrose High School, which back in the day would have been the end of the Melrose Half with a loop of the track around the football field in front of the spectators. You don’t have to do this since the track is no longer there, nor are the spectators. You continue up to a right on Melrose Street and a right on Main Street which will take you back to Brueggers. The Water Stops will be manned by myself with helping hands from a mix of Tom, Hank, and possibly special guest Audrey Paradis! Thanks to all those that give their time to make the MRC SLR run smoothly. Roll Call, although some will decide to run the Stew Chase 15K this weekend I’m sure there are many looking for a good training run. Who’s in?! Week 1 challenged us with giant piles of snow, slippery footing, and frigid temperatures as you criss-crossed your way through Melrose Center. 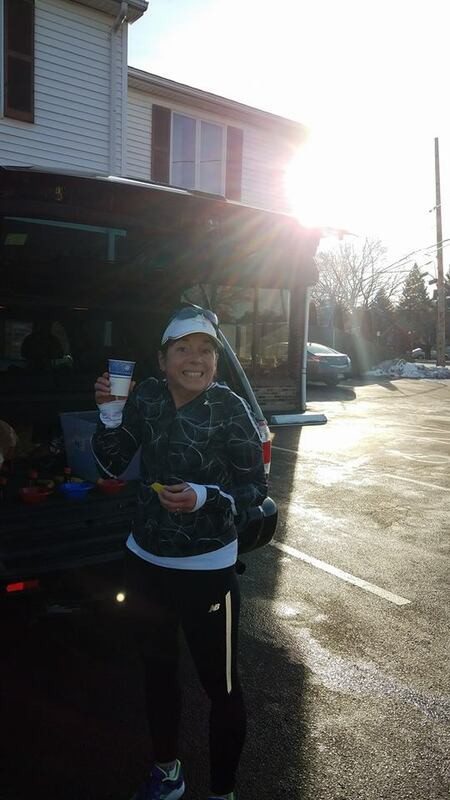 Week 2 followed up with more frigid temperatures as 35 runners came out to run along the shores of Spot Pond. Those are the weeks that build the character you need to push through whatever challenges you find in front of you on Marathon Day. This week Mother Nature has decided to give you a break. 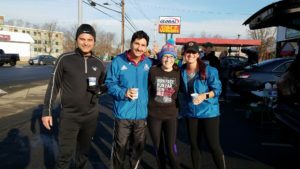 It will be above freezing for the start of the run, for the most part sidewalks are clear, and your run gets a little shorter, recovering from the hills and miles you conquered last week. 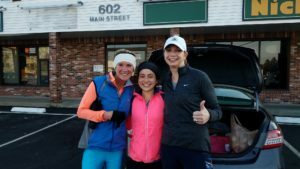 The Route this week takes you in to Wakefield, and if you’re running the full route, around Lake Quannapowitt. We’ll leave Brueggers at 8AM, heading north on Main Street past Ell Pond. New to the MRC SLR? Keep an eye out for the Clarence DeMar monument as you pass Ell Pond. Clarence lived and trained on the roads and hills of Melrose in the 1920s when he started his string of 7 Boston Marathon victories, the most by any one athlete. It has been an MRC SLR tradition for someone to tap the monument on the way by to honor the great runner… and ask for a little good luck on our journey to Boston. Continue up Main Street, into Wakefield, to the intersection of Main Street and North Ave/Nahant St. 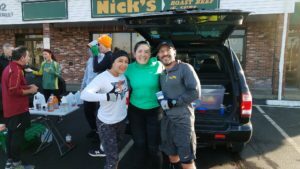 There you will find the Water Stop in the parking lot of Nick’s Pizza. 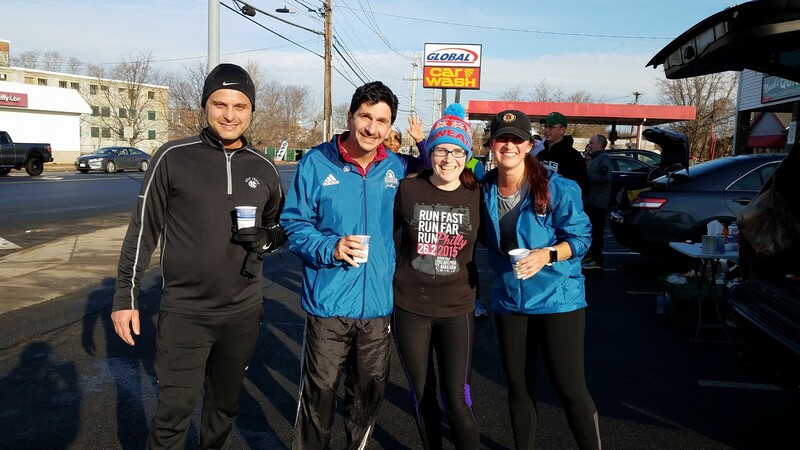 From there you’ll either turn around and head straight back to Brueggers along Main Street to finish your 10K. If you’re running long you’ll continue on Main Street, through Wakefield Center, staying to the right to continue along the eastern side of Lake Quannapowitt. Bear left on Lowell Street, and turn left on Quannapowitt Way to continue along the lake. In the Comverse parking lot you can either run along the lake if the path is clear, or run along the office building parking lot, either way continue out of the other side of the lot turning left on North Ave. At the set of lights by the softball fields on North Ave, turn left on Church Street and run to… wait for it… a church. Turn right there on Common Street along… wait for it… Wakefield Common. You’ll merge on to Main Street and run to Maine… just kidding… just run back to Nick’s for another Water Stop. 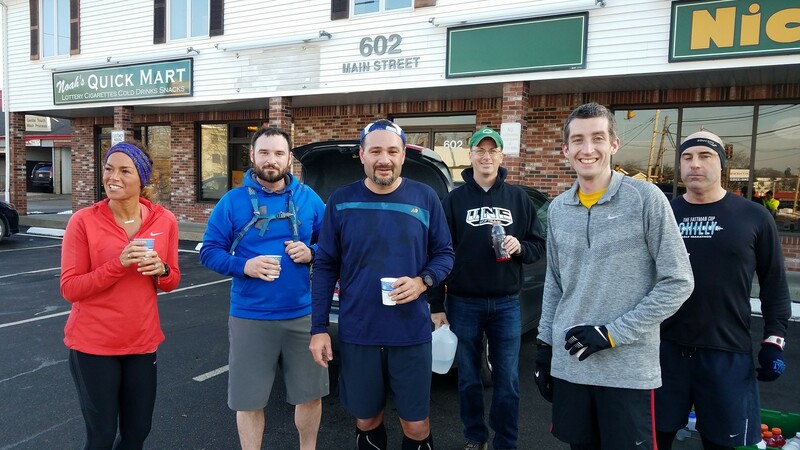 After that water stop you’ll head back to Brueggers along Main Street to finish up your 10.7 mile run. Water Stops will all be at Nick’s and hosted by myself and Hank and Tom if they want to come help. Simple. Roll Call! Who’s in for a nice, flat, reasonably temperatured Sunday Long Run? Week one we dealt with frigid temperatures and lots of snow. 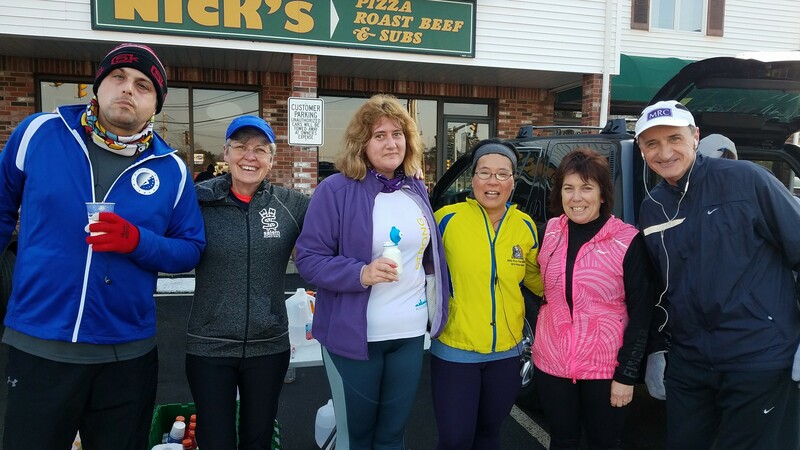 A dozen dedicated souls met at the Knights and ran a modified route to get their training miles in. This week warmer temps and a lot of rain has made the snow disappear, but cold temps are about to come back. I just checked out the route and even ran 3 miles myself, things look on the course. One other noteworthy event was a small fire happened at Brueggers, closing it for a day. I have confirmed its back open so we’ll be meeting there in the morning. This week we have 12 miles on tap for the marathon trainers, and 7 miles for those training for a half marathon. 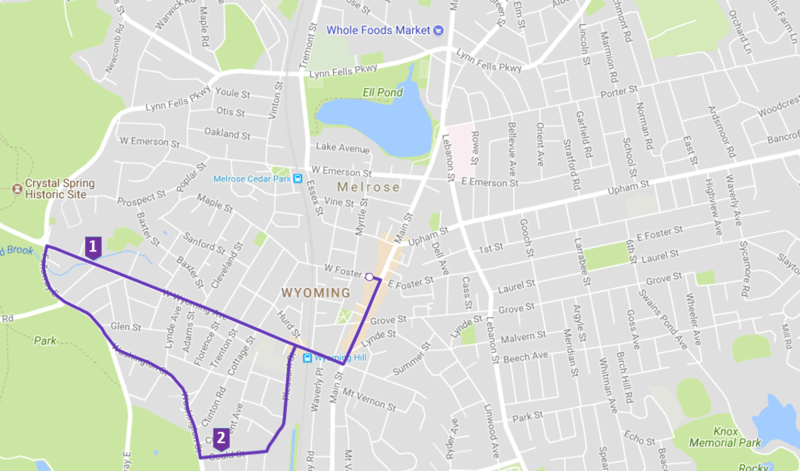 The route will start from Brueggers, head down Main Street towards Malden, but turning right onto West Wyoming. When you get to Grimsby’s turn left onto the Fellsway West. This week continue through the hills on the Fellsway West to the traffic circle at Highland Ave where you’ll turn right. Highland Ave will take you up to water stop 1. After that stop, shorter route runners will continue straight on Woodland Road past the Flynn Hockey Rink. I’ll refer to that as “the front side of Spot Pond” from a Melrose point of view. Meanwhile long route runners will turn left onto Elm Street towards “the back side of Spot Pond”. Shorter route runners will continue along the front side of the pond until they come to Pond Street where they’ll turn right and come down to Grimsby’s. 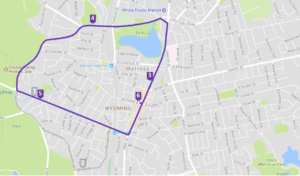 Take a left onto the LynnFells Parkway, run past Melrose High School and turn right on Melrose Street and right on Main Street to get yourself back to Brueggers. Long route runners will run to the end of Elm Street and turn right. That will take you up a hill, under I93, past the Sheepfold, over I-93 and past an off-ramp of I-93 (watch for cars exiting the highway!) where you’ll turn right into a parking lot at Straw Point. There will be a small water stop there. Continue around the pond turning right as you exit the parking lot, past the Stone Zoo, onto Woodland Road, past the Flynn Rink back to Highland Ave where you’ll hit the first water stop again. After that water stop, turn left on to East Border Road, up a hill to a set of lights where you’ll turn left back onto the Fellsway East. Run the hills past Grimsby’s and onto the LynnFells Parkway. Run past Melrose High School and turn right on Melrose Street and right on Main to get yourself back to Brueggers. Water stops will be manned by Hank, Tom, and I. Roll Call, who’s in for a long run! Happy New Year Runners! While its only the first week of the year, its time to look forward and start to plan for to the Spring racing season. 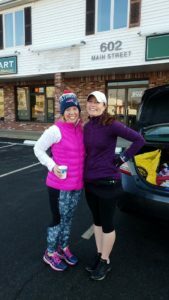 For the 12th year the MRC Sunday Long Run is there to help you meet those goals come springtime. How the SLR works… for those that haven’t participated in the SLR before, this is how it works. Read this blog prior to the run and reply if you plan on running so I can bring enough water supplies for everyone. Review the route map so you know where you’re going. Check the weather so you’re prepared for the ever-changing New England weather. Put a dollar or two in your pocket to donate to the water stop supply fund for that week, supplies are there for those that donate. Show up at Brueggers before 8AM on the morning of the run. Keep your voices down inside Brueggers and stay clear of where customers line up to order and where the coffee station is… we’re guests of Brueggers, be considerate of their business. 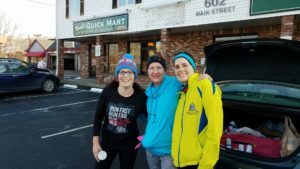 We’ll head outside on Main Street, review the route, and head out for the run. When you come to the water stop, have a drink and a snack, and continue on. If you start early and plan on using the water stops, please let me know in the blog. 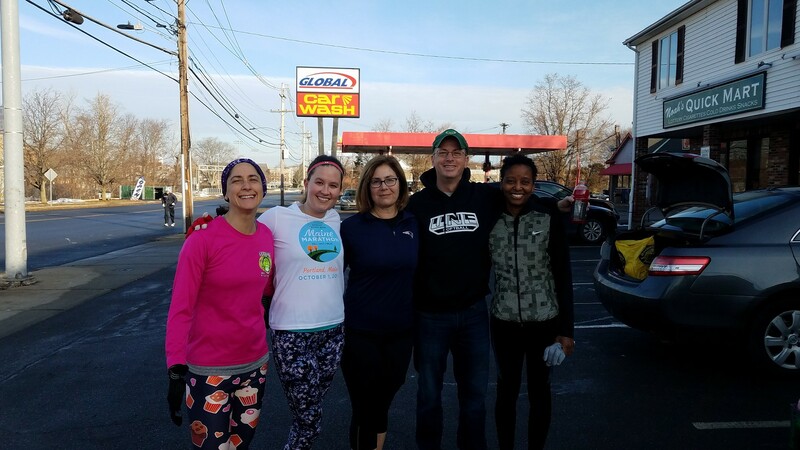 After the run completes back at Brueggers, consider changing your clothes and having a post-run breakfast there. They allow us to meet in their place of business and its good to return the favor by patronizing their business. Please refrain from bringing in outside food and drink. Go the MRC website and click Sunday Long Run for more information about the program. 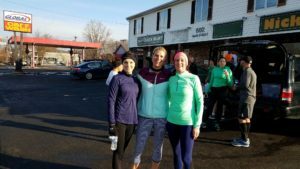 This week’s run… The SLR will start on Saturday this week, 1/6, since the MRC Holiday Party/Winter Banquet is Saturday night. 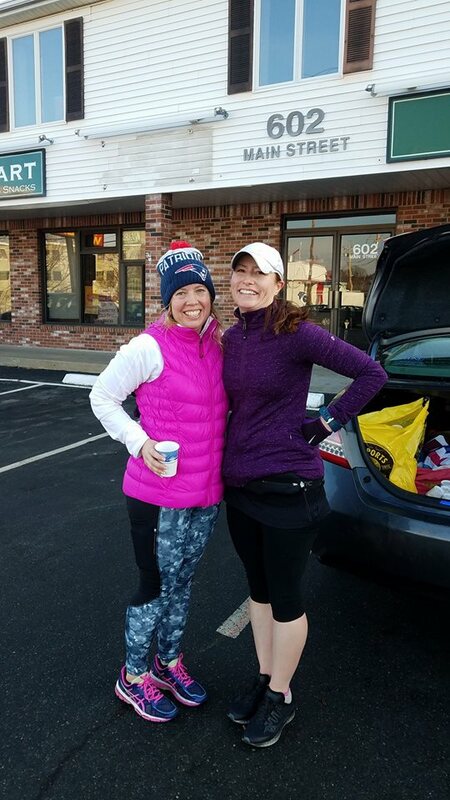 We’ll be dealing with increased traffic on Saturday morning, which coupled with snowy/icy sidewalks means all runners should stay alert on the road, run facing traffic, and run single file when the road narrows. Another thing to note is that there is a 3 hour parking limit in the parking lot beginning at 8AM, meaning you’ll need to leave the lot by 11AM or risk getting a parking ticket. This year there is one less weeks between New Year’s Day and Patriots Day so we’ll run a little longer in our first week. 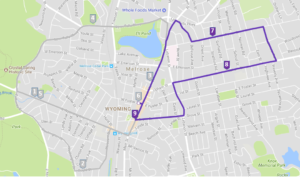 The NEW route… Due to the extreme cold forecast for Saturday Morning, we’ll be meeting at the Knights of Columbus instead. We’ll be running 2 or 3 loops from the Knights around Melrose Center. This allows me to stay warm inside, allows you to have extra clothes at the ready to change/adjust after each loop, and you have a chance to warm up a little bit mid-run. We did this a few years back on a frigid Valentines Day and all worked out well. Loop 1… This short loop will head down Main Street to a right on West Wyoming. Turn left at Grimsby’s and follow the Fellsway East, bearing left onto Washington Street. Follow Washington to a left on Goul Street which will cut over to Pleasant Street. At Pleasant turn left and follow to the end where you’ll turn right back on West Wyoming. Turn left on Main Street and get yourself back to the Knights. 2.8 miles complete. Loop 2… This loop is the 3 mile MRC summer loop backwards. Head up Main Street past Ell Pond, turning left onto Melrose Street and left again onto the LynnFells Parkway. Follow that to Grimsby’s and turn left onto West Wyoming, follow back to a left on Main Street and get back to the Knights. If you are running the shorter distance your 6 miles is complete. If you’re running the longer route head back out for Loop 3. Loop 3… The final loop will start up Main Street past Ell Pond where you’ll cross over to bear right onto Green Street. Turn Right on the LynnFells Parkway. Take your immediate right onto Bellevue, crossing over to take your first left on Porter Street. Follow Porter to Ardsmoor Road. Follow to the end and turn right on Upham. Follow Upham to a left on Lebanon St. Continue to Grove Street where you’ll turn right, follow to Main, turn right again and finish up at the Knights for a 9.1 mile run. The Knights will be opened at 7:45. There will be water, gatorade, and candy at waterstops inside the Knights. There will be no Gu available, that will show up at longer runs only. If you need gu for runs <14 miles, please bring your own. Some cold weather tips: wear mittens if you have them, your fingers will keep each other warm. Wear taller socks, low socks leave the potential of unexpected ankle exposure. Vaseline on exposed skin creates a barrier that reduces wind burn. Sunglasses will cut down glare and pr0tect your eyes from the wind. Dress in layers, you can always remove some layers at the water stops. Wear a hat that covers your ears. Unlike night running where lighter colored clothes are more visible, against the snow you want florescent of darker apparel to stand out. And again, run single file! 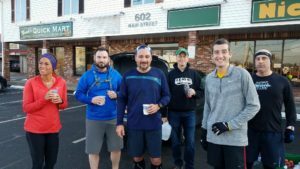 The waterstops… I’ll man the water stop at the Knights of Columbus with Mike Quigley. Remember… We’re running Saturday, we’re running from the Knights, it’ll be cold, leave by 11AM so you don’t get a ticket!